Failed wrist fusions fortunately are an infrequent problem for the hand surgeon to deal with. However, when it does occur, the surgeon may be faced with a multitude of problems relating to poor bone quality, bone loss, as well as copious scar tissue. Reconstructive options include autologous bone grafting, bone morphogenic protein, and external and/or internal bone stimulators. If the hardware has truly failed, the hardware may need to be changed out, but if there has been any windshield wiper effect to the bone, bony struts may have to be used. In the presence of previous infection, one can consider vascularized fibular bone graft. More recently, some wrist fusions that have failed to unite are being replaced with joint arthroplasty of the wrist. 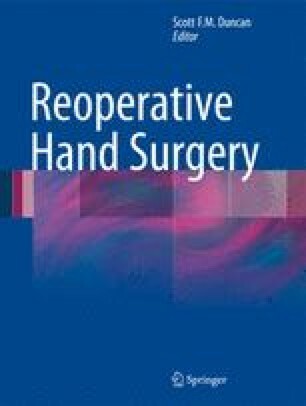 Ultimately, the surgeon has several options available in order to treat this clinical problem, which can leave the patient functionally impaired, secondary to the wrist deformity and pain. Ultimately, if satisfactory fusion or joint replacement can be obtained, improved but not total pain relief can be expected.